A week short of a month has passed since the June 15th raid in which the temporary residents of Gezi Park have been once again violently pushed off, injured and taken into custody in a disproportionate show of force by the police. Much has happened since then. First and foremost, the pending final decision on the court case affirming the decision to keep Gezi Park as a public park and green space has been announced. Riot police filled in the empty space left from the civilian occupiers of the park, apparently taking an intense liking to literature. You must have seen photos of them while dosing in the cool shade of the sycamores and holding their books upside down. One day a lone standing man appeared, just standing in silent protest in front of the opera building, which by now has long been stripped off its colorful exterior of banners and flags. He was soon joined by others showing up and standing in silent protest anywhere, everywhere: most significantly at the shooting site of one of the victims of police violence. And yes, the police that shot Ethem walked free. The judge ruled “self defense”. While the protests continued outside, so did the beehive of activity of municipality workers inside the park. Flowers, trees were brought in and planted in a matter of days. Yet the park is still cordoned off, inaccessible. Its true owners, the public, is outside demonstrating, demanding freedom, one of which is freedom to enter their beloved park. The press? I will tell you their story in a different post, but they still haven’t redeemed themselves. They merely moved on from penguins to an extensive coverage of Egypt. 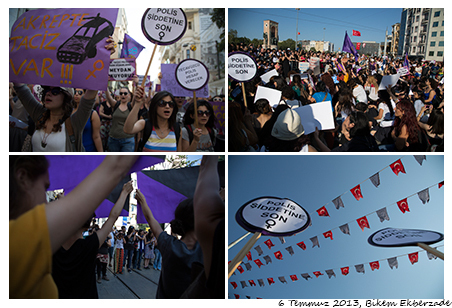 For them Gezi never happened. For me, they are mere ostriches, burying their head in the sand forgetting that the rest of their body is still exposed to outside elements. I promise, more on that later. The Prime Minister? Well he took a vacation in a small coastal village along the Aegean. 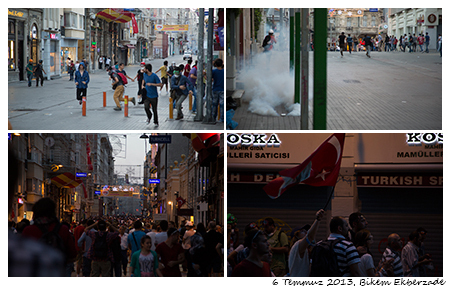 While he was on vacation Ankara was burning with teargas. Where did the occupiers go? Past that dreadful June 15, they went to the parks. They gathered in public parks all around the country and held forums, workshops, panels.. They still go on to this day. And just yesterday we all tried to go back to our park. We had missed the cool shadow of the sycamores and the linden trees. What happened? Well, you can see that below. The mayor says we cannot go in until he says it is time. While he assumes the role of the warden of Gezi Park, the public keep on reminding the officials that this country we live in is not a prison, and we certainly are not prisoners waiting to be told where to go, and when. Yes it is a battle after all. One of brains and creativity and humor, against archaic order and blind obedience. Welcome to the new Turkey of civil disobedience, where the rules of the game are not dictated by an archaic elite and ancient politics, but by clever 20 somethings. Welcome to the Turkey of the ’90s generation. ← Hey mom! I’m out making revolution, won’t be late!